Thanks to: Bob Keith, Maurice Williamson and Bruce Ropner for all their help in the compilation of this profile. In 1965 the Dos Palmos car was purchased from Goodnight Keith and Williamson by a syndicate calling themselves the Croft Drag Racing Partnership after the Croft racetrack near Darlington. The six members of the group were BDRA members Bruce Ropner (a director of Croft who had run his 4.7 litre Cobra at the '64 Drag Festival), who was the team skipper, Norman Barclay, an ex-bobsleigh champion, John Ropner (Bruces cousin), Gerry Belton (BDRA General Secretary) Keith Schellenberg and Peter Godlee. Although the price paid was not revealed at the time it was reported to have been extremely low. This was encouraging news for the UK Drag racing scene, suggesting that maybe more UK racers would be able to afford to import exotic American machinery. When I spoke to Bruce Ropner he was not 100% certain but thought the price of £950 sounded about right. Rumours spread that a famous racing driver was being brought in to drive but these were false and the original intention of the group was to all take a turn in driving. The car was kept at Darlington with Peter Godlee looking after the mechanical side of things. The Goodnight/Keith/Williamson partnership provided a long tape recording covering the complete preparation and running of the car. The engine was de-tuned to the extent that the blower drive ran at 1:1 instead of being overdriven. Gary Goodnight recalled that the car was notorious for consuming piston rings. "We had sold the small block car to the group in Leeds. We lost track of the guys who bought it, and I always wondered if they could keep rings in it. It had a 1" stroker and the pistons were so short, they wobbled in the bores and you had to change rings every 5-6 runs. We got so fast at changing rings, it was like changing spark plugs". In June 1965 the car arrived back in the UK. Bruce Ropner recalls that the first outing for the car was for test runs on one of the runways at RAF Dishforth in North Yorkshire. Permission to do this was granted by the RAF and Bruce became the first person to take to the drivers seat. There was no timing equipment for those initial runs but things looked promising and despite never having driven a dragster before Bruce soon got the hang of things. The next outing for the car was at the BDRA practice meeting at Graveley in Cambridgeshire on June 19th where the team had to quickly come to terms with the work involved in running such a high performance machine. Once again Bruce climbed into the drivers seat and this time the clocks were running. The runway at Graveley was not in regular use and Bruce recalls that the dandelions that grew through the cracks in the surface had just finished flowering. One of his outstanding memories of that day was those dandelion heads. 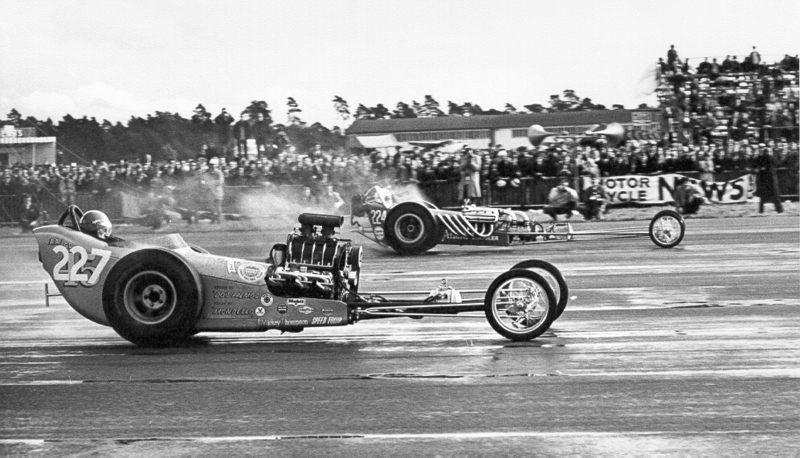 "The dragster of course had no front bodywork and so the front axle acted like a haycutter! It was like driving through a blizzard, it was quite scary." Despite this Bruce made his mark on UK Drag Racing history that day by becoming the first British driver to go under ten seconds with a 9.74. "Everyone told me that I was the first to go from 0-150mph in under ten seconds. Wether they were right or not I don't know, but everyone said that I was". As this was only a practice meeting Bruce never received full recognition for this historic milestone in British Drag Racing. The title of first British driver into the nines would officially go to one of his partners at the cars next outing. The next appearance came at the Vickers Gala Day at South Marston near Swindon on July 3rd where Norman Barclay was behind the wheel. His first run stopped the clocks at 10.55 seconds which looked very promising. Just before lunch the car came out again and Barclay officially became the quickest British driver on British soil with a 9.77/155. The next run was the final of the Class 17 eliminator. There had only been one other entry, the latest Dragster Developments machine of Allan Herridge which was already back on the trailer. The Cadillac powered rail had suffered severe clutch slip and rear axle bearing failure. Unopposed Barclay won the teams first trophy with an 11.46/154. One spectator wrote to British Drag Racing magazine after the event commenting that he "was miserably disappointed with the display by the Dos Palmos Dragster", he continued with "I mean, to splutter to 154mph in a quarter of a mile is not good enough". Gerry Belton defended the cars performance comparing the times with those run at the Drag Festival the previous year. He also commented that having driven the car himself it was very difficult to launch it without bogging the motor. He went on to state that the team intended to fit a rev counter in order to ensure that the car would leave the line with adequate wheelspin to prevent any serious breakages in the driveline. In 1965 the car appeared at the Drag Festival at Blackbushe with Norman Barclay behind the wheel again. Despite some stiff competition from other British Dragsters such as the mighty Allard Chrysler and Allan Herridges promising 'Pulsation' slingshot Norman managed to win the Class 15 elimination and set the second lowest E.T. at 11.36. He also finished up a a semi final loser in the A Class eliminations. A week later at the Woodvale Dragfest Norman was back in the nines with a 9.65, the second fastest time by a UK competitor at the event. He was just beaten to the class 15 elimination title by Alan Allard. Bruce Ropner has fond memories of Norman Barclay. He recalled how Extreme Magazine had christened him 'The Godfather Of Extreme Sport'. As well as racing bobsleighs and Formula two cars he took part in powerboat racing around the coast of Britain and was the first person to waterski from Scotland to Ireland. He was also the first person to pilot a hot air balloon over the Alps into Italy during winter. Sadly although none of these antics got the better of him he died from cancer in 1998. The team towed the car on a trailer behind Bruce Ropners 1954 Talbot Sunbeam to exhibit it at the Frankfurt Motor Show in 1965 and afterwards the car was used very little. Ownership passed solely to Keith Schellenberg who kept the car without use until 1969.